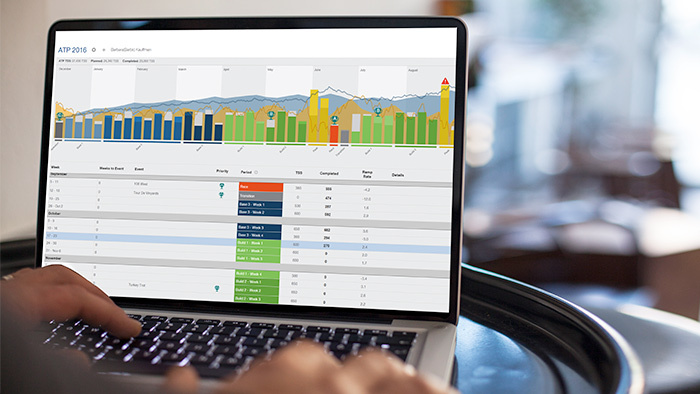 TrainingPeaks recently released an update that makes it easier than ever to plan your season based on Training Stress Score (TSS) and target Fitness (CTL) for race day. We asked expert coaches Alan Couzens and Jim Vance to discuss why you should start planning with TSS and how you can get the most from this powerful new feature. TrainingPeaks: Why is TSS an important metric for planning your athletes’ seasons? Alan Couzens: Since the Performance Management Chart (PMC) is based on the relationship between a given Fitness (CTL) and an athlete’s performance, it makes sense when targeting a certain performance level to equate that with a given training load. By observing the athlete’s PMC over time we can get a sense of the load:performance relationship for that athlete to determine what Fitness (CTL) it is going to take to reach a certain goal. Once we have this goal Fitness (CTL) number, the next logical step is to plan the TSS progression that will ‘add up to’ this target CTL on a given date to maximize our chances of achieving our goal performance. Jim Vance: Some people claim that TSS monitoring ruins or takes away from the art of training. I disagree. I believe it only enhances the art, because the training decisions the ‘artist’ determines should be based on the data. If you don’t make the decisions based on the data, and instead on tradition or a timeline, then you are making decisions that have nothing to do with how the athlete is actually responding. One of the hidden benefits of stress-based periodization is that athletes can get a better sense of self, training according to their stress levels and making decisions that help them balance the load, instead of just following random training guidance. In the end, it doesn’t ruin training; it enhances it well beyond what an athlete could expect. TrainingPeaks: How do you determine weekly TSS and/or Target Fitness (CTL) for your athletes? Alan: I determine target peak Fitness (CTL) by looking at both the athlete’s goals and by looking at what Fitness (CTL) ramp rate they have been able to handle in the past – then combine these with how long it is until their ‘A’ priority race. I don’t actually see a whole lot of difference in TSS between events. Fit athletes are fit athletes and often those at the front of Ironman events are the same athletes at the front of Olympic Distance events (at least among Age Group competitors). When it comes to different events, the average volume and intensity may be different to account for the different intensities that need to be prepared for, but overall training load is similar. That said, I do see a lot of difference in TSS/CTL numbers for different levels of athletes. I’ve provided some general guidelines in the table below for typical Fitness (CTL), peak weekly TSS and annual load (TSS/hrs) for different levels of athlete that I work with. Of course there are ranges of performance in and around these numbers – for instance some pro’s are closer to the top age group athlete’s Fitness (CTL) numbers and some Kona qualifiers are closer to the middle-of-the-pack numbers, but these numbers can serve as a general guideline. Jim: Target Fitness (CTL) varies widely based on an athlete’s history, goal event, and ability level. I recommend setting peak bike and run Fitness (CTLs) separately based on percentages of Bike Threshold Power and Functional Threshold Pace for the run (see the guidelines below). However, these are only guidelines and that there will be athletes who won’t fall into them. Swim, bike, and run skills play an important role in whether or not an athlete achieves these goals. TrainingPeaks: What is the maximum Fitness (CTL) increase you aim for week-to-week or month-to-month? Do you recommend a max ramp rate? Alan: I’ve found from experience, a ramp of 5-15 per month is a good sustainable range for most athletes, with more ‘fragile’ athletes – often those with higher life stress – on the low end and more ‘hardy’ athletes on the high end. I always heed Alberto Salazar’s advice when it comes to progression – “be patient, not a patient!” To raise Fitness (CTL) in a 3:1 structure, loading weeks should be 3x the target Fitness (CTL) ramp, (e.g. to raise your Fitness (CTL) 10 points in a month, loading days in the 3 loading weeks should be at Fitness (CTL) +30 TSS/d.) To get from a Fitness (CTL) of 100 to 110 over the course of a month, loading days should be about 130 TSS/d. Recovery days (in the recovery week) can be at Fitness (CTL) – 30 TSS/d. Jim: For triathletes, you’ll need to determine how much you want to raise your bike Fitness (CTL) each week and how much to raise run Fitness (CTL). Realize again that 1 bTSS does not equal 1 rTSS, because the weight-bearing aspect of running makes it much harder on the body. So how does a change of 3.5 in Fitness (CTL) per week look in terms of risk in training? That depends on the starting point of the athlete’s Fitness (CTL). TrainingPeaks: How do you determine the TSS for an individual workout? Alan: By using the above [target CTL] guidelines, we get loading, recovery and also maintenance days (days where TSS is approximately equal to the athlete’s current Fitness (CTL)). It is then up to the coach and athlete to identify the best use of the loading days. For example, if our hypothetical athlete with a Fitness (CTL) of 100 is preparing for a 40K TT, threshold endurance will be an important physiological quality to develop, in this case, the developmental/loading 130 TSS days will probably be centered around this quality, while the 100 TSS maintenance days may be devoted to maintaining secondary qualities like aerobic endurance. An additional question is how are you going to distribute the TSS ‘budget’ among sports? A typical triathlete distribution may be in the range of 20/50/30 for swim/bike/run but, at certain points in the build we may include emphasis periods where we significantly increase the emphasis on one of these, e.g. we may plan a block of training for a swim limited athlete where 40% of the TSS budget is spent on swimming. Above all else, both coaches stress that these are only guidelines and will provide a good place to start. Athletes must take into consideration their training history, health, and current fitness levels before adopting one of these targets. Learn more about how to plan your season with TSS. To read more about planning with TSS pick up Jim’s book Triathlon 2.0: Data-Driven Performance Training or go to AlanCouzens.com.